International Women’s Day is being celebrated on March 8 across the world. It is an annual marker that aims to bring attention to women’s accomplishments and obstacles. The theme for International Women’s Day 2018 is ‘Time is Now: Rural and urban activists transforming women’s lives‘. The theme aims to encourage women to raise voice for their rights and promote growing global movement to support gender parity. The first Women’s Day was celebrated on February 28, 1909, in New York by the Socialist Party of America. The day was dedicated to the 15,000 women who marched through New York in 1908 as part of the garment strike. In 1910, a German activist Clara Zetkin proposed the idea of celebrating Women’s Day in March at the 1910 International Conference of Working Women in Copenhagen. On March 19, 1911, Women’s Day was celebrated in Austria, Denmark, Germany, and Switzerland. In 1975, the United Nations declared March 8 as the official date to celebrate Women’s Day. Balkrishna Doshi is the newest winner of the Pritzker Architecture Prize, known as the Nobel for architects. He has built more than a hundred buildings that reflect his investment in local materials, social change and the environment. He is the first Indian to receive the award. The international prize, which is awarded each year to a living architect/s for significant achievement, was established by the Pritzker family of Chicago through their Hyatt Foundation in 1979. The award consists of $100,000 (US) and a bronze medallion. Nari Shakti Puraskars 2017 were presented to 30 women by the President on the eve of International Women’s Day. The Nari Shakti Awards were initiated in the year 1999. Anuradha Krishnamoorthy and Namrata Sundaresan of Chennai have founded an enterprise called Kase which produces 20 varieties of unique artisanal cheese. Kase is a social enterprise and is produced by women with disabilities. Both women have unusual backgrounds. Ms Krishnamoorthy is the founder of a BPO that trains people with disabilities. Ms Sundaresan is the founder of a strategic consulting firm for international investment. In a short span Kase has become very popular. The cheese is made from the organic milk of grass fed cows with no preservatives or chemicals of any kind. Between 1960 and now, of the 1,10,000 lakh varieties of rice, only a few thousand now survive. For SheelaBalaji, Chairperson and Managing Trustee of NGO AIM For Seva, this variety was something she wanted to bring back. So she not only grew these lost gems but also made sure that people could taste them and encourage farmers to grow them once again. Sheela researched the different nutrients and medicinal values that old rice varieties contained and started growing them on the 40 acres of land that belonged to the NGO. She started a festival of grains in Manjakkudi village in 2013. She started with just four varieties of rice and within four years, she has preserved nearly 30 varieties. Her organization Aim for Seva is one of the largest NOGs in free education. It has over 100 free students hostels in 16 states across India where books, uniforms, school fees and more. She is involved in providing value based education to rural and tribal and providing aid to victims of natural disasters. 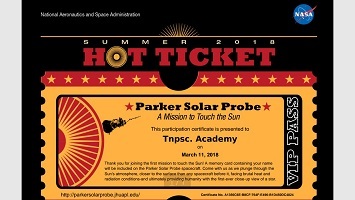 Parker Solar Probe is part of NASA’s Living with a Star Program, or LWS, to explore aspects of the Sun-Earth system that directly affect life and society. Parker Solar Probe will swoop to within 4 million miles of the sun’s surface, facing heat and radiation like no spacecraft before it. Forty Indian-origin students from nine countries are arrived in India to participate as part of the 46th edition of Know India Programme (KIP). Madhya Pradesh is the partner state for this edition of the programme. Know India Programme is a flagship programme of Ministry of External Affairs for engagement with Indian origin youth (between 18-30 years) to enhance their awareness about India, its cultural heritage, art and to familiarise them with various aspects of contemporary India. On the occasion of the 47th National Safety Day on March 4, Safety training programmes, audits and various competitions will be held regularly to spread awareness. Forbes’ 2018 ‘World’s Billionaires’ list includes Eight Indian women out of 256 women of World’s Richest. Among the Indian women, Savitri Jindal and family is the richest with a fortune of $8.8 billion. She is ranked 176th globally. Biocon chief Kiran Mazumdar-Shaw is the second richest. She is India’s richest self-made woman with a fortune of $3.6 billion. Others include Smita Crishna-Godrej and Leena Tewari, who chairs the privately held drugmaker USV India. The world’s oldest message in a bottle has been found on a beach in Western Australia. Tonya Illman found the 132-year-old bottle in the dunes near Wedge Island in January. Inside the bottle, found a roll of paper printed in German and dated to 12 June 1886, which was authenticated by the Western Australian Museum. The United States Holocaust Memorial Museum has revoked a prestigious human rights award it had given to the Nobel laureate Daw Aung San Suu Kyi. Daw Aung San Suu Kyi, Myanmar’s civilian leader, faulting her for failing to halt or even acknowledge the ethnic cleansing of her country’s Rohingya Muslim minority. Ms. Aung San Suu Kyi, who endured 15 years of house arrest for taking on the military dictatorship in Myanmar, was only the second person to receive the award, in 2012. It was named after Elie Wiesel, a fellow recipient of the Nobel Peace Prize and a Holocaust survivor who was one of the museum’s founders. Mr. Wiesel was the first recipient.